Harry Winks greeted Lionel Messi as "the biggest ever" after Barcelona broke the Champions League hopes in Tottenham Hotspur for Wednesday's 4-2 win at Wembley. 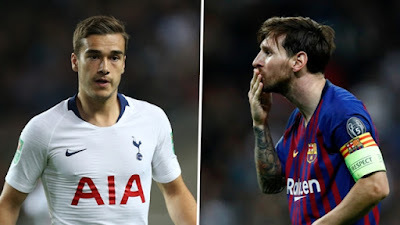 Messi scored two and did two as Mauricio Pochettino's team failed to recover from defeat in Milan two weeks ago, dropping six points behind the first two in the match to qualify for team B and Winks believes that his side was finally overthrown by "Argentine. The Spurs fell 2-0 behind the first half in Wembley before Harry Kane doubled the arrears shortly after half, only for Messi to restore Barca's edge with a close finish. Erik Lamela pulled one back for Tottenham before Midi was added to the fourth. Winks, who started with the first Champions League game of the season, played 90 minutes as he continued his recovery from the ankle injury, which kept him out of last year's cane, and then talked about pride with the five-year-old winner of the Balon d'Or. "He liked it a lot," he told Evening Standard. "To play against him was a price. The result is far removed from the enjoyment of the game, but in the years to come, when I look back and say that I played against - in my opinion - the biggest player playing football will be a proud moment. "It is so hard to think about this now that we have lost and, ultimately, this is the most important thing. I am evicted. "The only way I can really describe [who is facing] is that once he has finished football, the man knows exactly who they are, the weight of the passage is just great, he's an expert, but everyone who has played against him has said same thing for years. " Winks made five Champions League appearances for Spurs last season when they reached the end of the 16th away from Juventus, while the 22-year-old Englishman broke into the first team at White Hart Lane in 2016 to learn from her best Europe as it seeks to establish itself as a regular presence on the continent. "For me, it was special to play against a player like this, I learned a lot from it, I will watch the game back and I will analyze my game. There were times when I gave the ball away with bitterness, which was not good enough. "